The news of the kidnapping and brutal mutilation murder of twelve year old school girl, Marion Parker, had shocked Los Angeles residents more than any crime in recent memory. Everyone in the city was following the hunt for Hickman. Aggie Underwood watched the case unfold from the special vantage point of the newsroom at the Los Angeles Daily Record. She read the copy as it was transformed into the headlines that kept Angelenos on the pins and needles awaiting word of Hickman’s capture. The citizens’ outrage manifested itself in the near lynching of a young man who had the misfortune of resembling William Edward Hickman. Other Hickman-look-a-likes were tracked, taunted, and threatened all over the city. More than 7,000 police officers, augmented by 12,000 members of the American Legion, and cops from neighboring cities were out hunting the killer. Because Hickman’s photo was on the front page of every newspaper from L.A. to San Francisco and beyond, cops were beginning to get a picture of him not only as Marion Parker’s killer, but as a bandit. People were coming forward who were able to I.D. Hickman as a drugstore robber; and it seemed that when he hadn’t been sticking up pharmacies he had been cashing bad checks. Reporters were digging into every corner of Hickman’s life, including the inevitable interviews with neighbors, who described him as a “mild boy”, and his mother who predictably sobbed and referred to him as a “good, clean boy”. Mrs. Hickman’s good, clean boy had managed to elude the law from Los Angeles all the way up to Pendleton, Oregon where, on December 22, 1927, he was captured following a car chase on the Columbia River Highway. Aggie was in the newsroom when the wire came in reporting the capture of William Edward Hickman. In her excitement she decided to phone her husband with the headline that everyone in Los Angeles was waiting for. Aggie’s friend and mentor Gertrude Price overheard the conversation, and when Aggie was finished Gertrude took her aside and told her that she must never tell anyone, even a family member, about a story until it appeared in print. At first Aggie was crushed, she’d never have done anything to disappoint Price. It didn’t take Aggie long to realize that Price wasn’t upset, angry, or disappointed, she was teaching her a fundamental lesson about the newspaper business. It was a lesson that Aggie would never forget. It took Hickman only a few minutes in captivity to begin to shift the blame for Marion Parker’s atrocious murder onto the shoulders of an accomplice he named as Andrew Cramer. He began to weave a story that absolved him from everything that had happened to Marion except for the initial kidnapping. Hickman said: “Marion and I were like brother and sister. She liked me but she did not like Cramer, and she said she would like to stay with me all the time.” He went on to say that he had been gentle with Marion and had even taken her to see a movie on the night before she was killed. As long as he was in a confessing frame of mind, Hickman admitted to several of the drugstore robberies that he’d been suspected of committing. He claimed to have had an accomplice for those crimes as well. Cops had to follow up on Hickman’s assertion that his accomplice, Cramer, had been the one to murder and mutilate Marion Parker. What they discovered was that there really was a Cramer, three of them actually — and it was Kramer, with a “K”. The Kramer in question had an unbreakable alibi; he’d been in jail since mid-August. The other two Kramer brothers were also exonerated, which left no one but William Edward Hickman as the sole perpetrator of the unspeakable child murder. Prior to being returned to Los Angeles, Hickman was examined by Dr. W. D. McNary, superintendent of the Eastern Oregon Asylum for the Insane. Dr. McNary said that Hickman’s mind “…seemed clear. He told a straight, coherent story and never was at a loss for words. There was nothing about him to indicate insanity. He did not differ a bit from hundreds of thousands of other young men”. 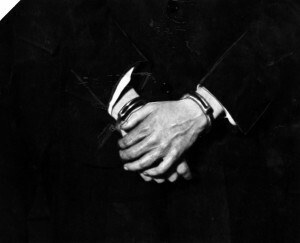 While awaiting extradition from Oregon to California, Hickman attempted suicide by strangling himself with a handkerchief. He was subdued by a guard. When the first try failed, he immediately tried again to end his life, this time by diving heard first from his bunk to the concrete floor – he was caught around the waist by one of the guards. Hickman and his captors, Chief Davis, Chief of Detectives Cline, and District Attorney Keyes, all of Los Angeles, were soon to be headed south on Southern Pacific train No. 16. Hickman would be finally be held to answer for his crimes. Aggie and the Fox, Part Two:The Hunt is On! On December 15, 1927, twelve year old school girl Marion Parker was unwittingly handed over to a monster by the school registrar at Mt. 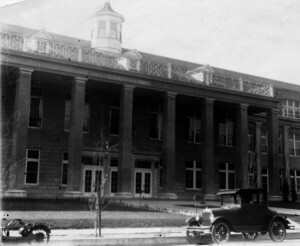 Vernon Junior High School. Her abductor had come to the school that day and said that Perry Parker, the girl’s father, had been seriously injured in an automobile accident and was calling for his youngest daughter. But Marion was a twin – which girl was the man talking about? 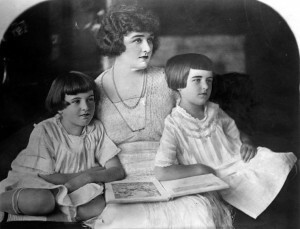 Both Marion and her sister Marjorie were at school that day. It was determined that Marion would be brought to the office for the simple reason that she was in class and Marjorie was on an errand on the school grounds, and so she was not immediately available. Marjorie was returning to the school office just as Marion was getting into a car with a dark haired stranger. Marjorie watched her sister and the man drive away. The Parker family waited in agony for Marion’s return, or at the very least for a communication from her kidnapper. They didn’t have long to wait. The day following Marion’s abduction the first of four ransom letters was received. The kidnapper demanded $1500 in cash for the girl’s release with the threat of death if the demand was not met. The first of the ransom notes was signed “George Fox”, the last of them were signed “The Fox”. On the morning of December 17, 1927, Perry Parker received a telegram reiterating the earlier demand for $1500 in exchange for his daughter’s life. That evening Parker took a call from the kidnapper. 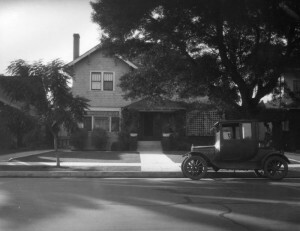 The man instructed Parker to drive to the corner of Fifth Street and Manhattan Place in Los Angeles, and told him not to inform the cops or Marion would die. The plan was for Parker to sit in his car and wait for the kidnapper to pull up next to him and show him that Marion was alive. The kidnapper would then collect the ransom money and drop Marion off a block down the street. Instructions from “The Fox”. Photo is courtesy of LAPL. 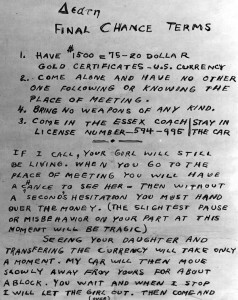 Parker followed the kidnapper’s instructions to the letter. He waited briefly at the designated meeting place for a few minutes before a Chrysler coupe pulled up beside him. He looked over and caught a glimpse of Marion sitting in the front seat. Parker sensed that something was wrong with the girl — maybe she was bound or drugged. Nothing could have prepared Mr. Parker for the reality. The driver of the Chrysler had a white handkerchief over his face and pointed a large caliber weapon at Parker. The man said: “You know what I’m here for. Here’s your child. She’s asleep. Give me the money and follow instructions.” Parker did as he was told. He was too close to getting his little girl back to make any move that would spook the man with the gun. The money was exchanged and Parker followed the coupe to 432 South Manhattan Place. The passenger door of the car opened and Marion was pushed out onto the lawn. Parker tried to get the license number of the car, but the kidnapper had bent the plate so that only a few numbers were visible. The Chrysler roared off and Parker ran over to Marion. He felt a few moments of relief, his girl was going to go home with him and everything would be as it was. Except when Parker got to Marion and took her in his arms he saw that not only was she dead, but she had been savagely mutilated. His screams made an unholy sound that reverberated throughout the neighborhood. Someone phoned the police. Marion Parker’s body was wrapped in towels. Her legs and arms had been hacked off and she had been disemboweled, the cavity stuffed with rags. A wire was wrapped tightly around her neck and then drawn up and wrapped around her forehead. Her eyelids had been sewn open so that she would appear alive when Perry saw her from a car length away. Bundles of Marion’s body parts had been scattered around town. A woman who lived about a block away from where Marion had been dumped discovered a suitcase that contained blood soaked papers and a spool of thread. The thread was a match for that used to sew Marion’s eyelids open. A reward of $1,000 was offered, but contributions from people all over the city brought the final total to $50,000 (over $600k in current U.S. dollars). Artifacts from Marion Parker case are on display at L.A. Police Museum. The first break in the case came when the towels that had been wrapped around Marion’s torso were identified as coming from the Bellevue Arms Apartments. A man named Donald Evans, who matched the description of the kidnapper, had rented a room in the building. 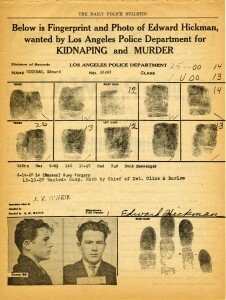 Evans was soon discovered to be an alias used by nineteen year old William Edward Hickman. Hickman had been a messenger at the same bank where Perry Parker worked, but lost his job after pleading guilty to forgery. He had had the audacity to return to the bank later and ask for his old job back, but Parker showed him the door. Parker also refused to supply a reference for Hickman when he applied for a job with another company. The cops were beginning to glimpse a motive. 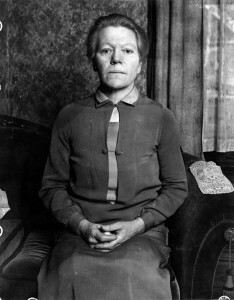 Fingerprints or not, the rest of the evidence was compelling enough to formally charge William Edward Hickman with the murder of Marion Parker. Life was getting scary for men who had the misfortune to resemble Hickman. One poor fellow was arrested five times before he was given a “get out of jail free” letter from the police. Another man who resembled Hickman was chased down and surrounded by a mob at Sixth and Hill streets in downtown Los Angeles. The police arrived just in time to save the man from being strung up on a light pole. The real Hickman had left town the day after collecting the ransom from Parker. 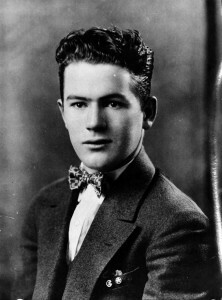 He’d carjacked a 1928 Hudson sedan on Hollywood Blvd, taken $15 from the driver, and headed north. The hunt for “The Fox” was on. NEXT TIME, THE CAPTURE AND THE CONFESSION. It had taken less than two years for Aggie Underwood to work her way up from switchboard operator at the Los Angeles Daily Record, to part-time assistant for one of the paper’s columnists, Gertrude Price (who wrote the Cynthia Grey column). On December 15, 1927, just a couple of days away from Aggie’s twenty-fifth birthday, she was working in the newsroom when reporters learned that twelve year old Marion Parker, the daughter of Perry Parker a prominent banker, had been abducted from her school. Marion’s twin sister Marjorie had not been taken. The kidnapper had arrived at Mount Vernon Junior High School where the twins were students and gone directly to the office of Mary Holt, the school’s registrar. The young man told her that Perry Parker had been seriously injured in an automobile accident and was calling for his youngest daughter. Times were different then. Holt never even asked the man for his identification, nor did she ask him what he meant by youngest daughter since Marion and Marjorie were twins and presumably separated in age by mere minutes. Any moment of doubt that Mary Holt may have had before releasing Marion into the custody of a maniac (who didn’t look maniacal at all) was overcome when the man insisted that he was an employee at Parker’s bank. When she was questioned later, Holt said the man had seemed sincere. He had been quick to suggest that if Holt doubted his word, she should phone the bank. If only she had. Instead of phoning the bank for verification of the stranger’s story, Holt dispatched an office assistant to fetch Marion from class. The children were in the midst of a Christmas party when the assistant delivered the news of Perry Parker’s accident. Marion didn’t hesitate; she accompanied the assistant to the registrar’s office where she was led away by the stranger. Witnesses would later recall that the man helped Marion into his coupe and “…patted her reassuringly on the shoulder”. As Marion’s friends watched the coupe drive away they had no idea that they were witnessing a kidnapping, or that the abduction would result in one of the most heinous murders in the city’s history. Once it had been determined that Marion had been kidnapped, terror and helplessness replaced calm and security in the Parker family home. They could not name a single enemy. The Parkers were prepared to meet any ransom demand, they simply longed for word that Marion was unharmed. LAPD, the LA County Sheriff, and the District Attorney’s office put all available men into the search for Marion. At that time it was the largest single manhunt in the city’s history. The scope of the search would not be eclipsed until 1947 when LAPD conducted a massive search for the killer of twenty-two year old Elizabeth Short, the Black Dahlia. NEXT TIME, THE HUNT FOR THE FOX.